Chocolate Flourless Cake is rich, velvety and silky smooth. Served with an easy homemade sweet raspberry sauce, to go with the chocolate flavor. You can make it in advance and freeze it. For some time I wanted to try to make my own Chocolate Flourless Cake since I had great results making flourless cookies, but somehow feared that a flourless cake may be a little more complicated. 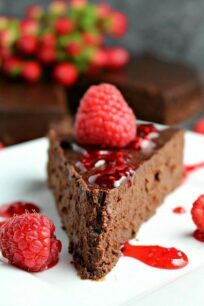 I was so wrong, this Chocolate Flourless Cake with an easy raspberry sauce, is easy to make, requires only a few ingredients and the result is a beautiful ultra chocolaty, velvety and rich cake. I couldn’t be more pleased with the results of this luxurious chocolaty dessert. In this recipe you can use bittersweet chocolate or semisweet. Choose wisely as it is basically exactly how the cake will taste, since chocolate is front and center. I personally prefer using semisweet chocolate, the additional sweetness is so perfect in this dessert. The texture of the cake is amazing, incredibly smooth, dense, and has great chocolate flavor, that has been elevated by the coffee added to the batter. This is the type of dessert that looks so fancy, and your guests will think that you labored over it for hours and hours in the kitchen. I liked very much serving it with ripe fresh raspberries, whipped cream and raspberry sauce. 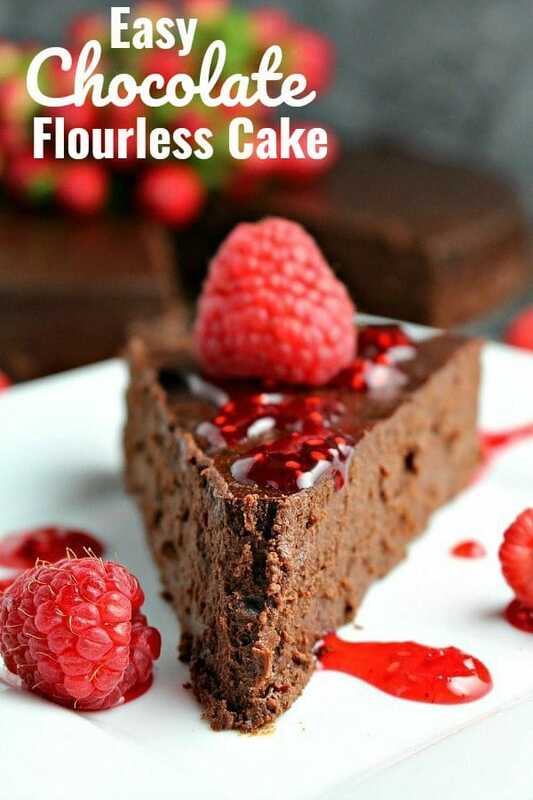 The bright and sweet raspberry sauce pairs nicely with the semisweet chocolate, and the whipped cream adds some lightness and it almost clears the palette for the next chocolaty rich bite. What do You Need to Make a Chocolate Flourless Cake? High quality chocolate – using good chocolate is very important, as its the predominant flavor in here! Eggs – this recipe asks for many eggs, make sure you are prepared. I like to use, organic, cage-free eggs for the best taste. Sugar – add more if you prefer your cake on your sweeter side, or if you are using bittersweet chocolate. Vanilla Extract and Coffee – these ingredients are important as they elevate the chocolate flavor. You can also replace the coffee with cognac or Baileys. Is Chocolate Flourless Cake Gluten Free? You have to be careful, as NOT all flourless recipes are gluten-free, so you have to check the ingredients carefully. This recipe specifically is gluten-free. Can You Freeze a Chocolate Flourless Cake? Yes, you can, and I am happy to tell you that this cake freezes exceptionally well. You can freeze it whole or just slice it up, wrap it well in plastic wrap and after that in foil or put it in freezer bags, and freeze. The cake can be defrosted in the fridge overnight. When done, the center of the cake should feel set to touch, and the edges will be just starting to pull away from the sides of the pan. You have to remove this cake from the pan really careful. Definitely make sure you layer the bottom of the pan with parchment paper and spray it with baking spray or grease it with butter. To release the cake, run a knife thru the sides of the cake. Tap the edge of the pan sharply on one side, and tap the pan again to release the cake. If it doesn’t, tap it a few more times. Another option is to bake the cake in a springform pan, but layer the insides with foil, to avoid any leakage. Definitely remove the cake from the pan and cool it before refrigerating. This cake is not to be served immediately. Allow it to cool at room temperature first, then cover it with plastic wrap and refrigerate for at least 3 hours, or best overnight. The cake keeps well in the refrigerator for up to four days. Also, since so many asked, here is the cake stand that I used in these photos. 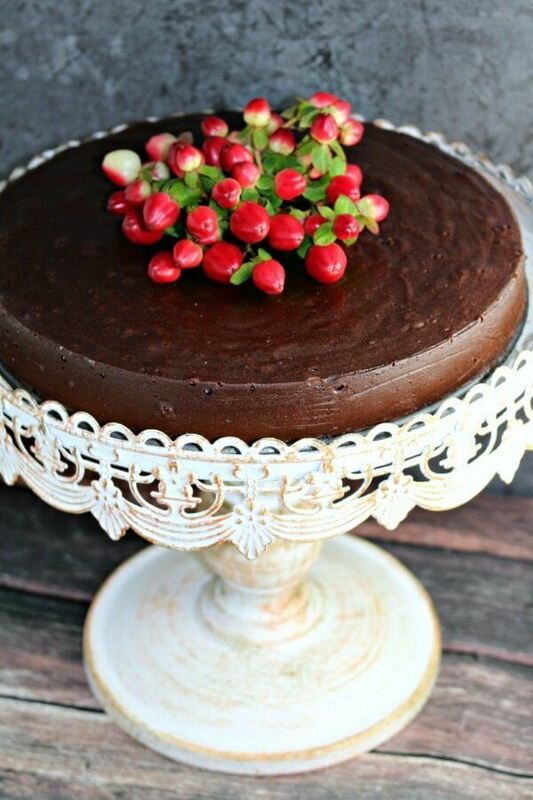 Chocolate flourless cake that is rich, velvety and silky smooth. Served with an easy homemade sweet raspberry sauce, to go with the chocolate flavor. You can make it in advance and freeze it. Adjust oven rack to lower middle position. Bring a full kettle of water to a boil. Add parchment paper to a 9 inch cake pan and grease it with butter. You can also cover the insides of a springform pan with foil and grease it with butter. In the bowl of an electric mixer fitted with the wire whip attachment, beat eggs at medium speed for about 5 minutes. They should be light and fluffy. Add water, coffee and sugar to a small sauce pan over medium heat. Simmer and stir until the sugar is fully dissolved. Add the chopped chocolate and butter to a large bowl, pour the sugar mixture over and stir until chocolate is fully melted and smooth. Stir in vanilla extract. Using a rubber spatula, fold ⅓ of the egg foam into the chocolate mixture, stir gently, but quickly, to not cook the eggs, from the warm chocolate mixture. Stir in until only a few streaks of egg are visible; fold in half of remaining foam, then last of remaining foam, until mixture is totally homogenous. Transfer batter into the prepared pan and smooth surface with a rubber spatula. Place the cake pan into a roasting pan, transfer to the oven and pour enough boiling water to come about halfway up of the pan. Bake for about 45 minutes, until cake has risen slightly, edges are just beginning to set, an instant thermometer inserted in the center of cake must read 140 degrees. The center of the cake should feel settled, when you touch it; the edges should come off slightly from the sides of the pan. Remove cake pan from water bath and set on a wire rack; cool to room temperature. Cool to room temperature, remove from cake pan, and cool in the refrigerator for at least 3 hours or overnight before serving. Combine raspberries and sugar in a small saucepan set over low heat. Cook until berries release their juices and just start to break down, about 4-5 minutes. Stir in cornstarch, and cook until mixture comes to a boil. Let cool. Store, refrigerated, in an airtight container for up to 3 days. Slice the cake and serve with raspberry sauce. It looks amazing!! I’ve never tried to make a flourless cake (yet! ), but yours looks amazing!! Beautiful!! 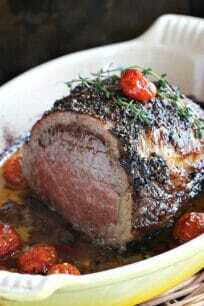 Thank you Whitney, its very easy and delicious! This cake looks amazing! That slice? drool! I can’t believe this is flourless! This looks so good! Yes, its flourless, but tastes amazing! I just made a flourless chocolate cake recently! I served it with strawberry sauce 🙂 I never thought about adding coffee though–I’ll definitely have to try it. Is it supposed to jiggle in the middle like it’s uncooked ? Hi Jen, no its no supposed to jiggle much. Its supposed to still be soft, as it will harden at room temperature, but not to jiggle us uncooked. I would cover it with foil and leave it 10 more minutes in the oven. What a lovely cake. I want to eat it! What a lovely cake. 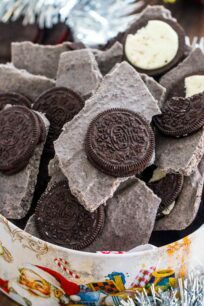 I wanna eat it all! Guess my pan wasn’t water tight. The water leaked in and made it a pudding. I’ve never made a flourless cake before, but have wanted to. I’m not a great baker, but this does look like I could do it. 🙂 I can’t wait to try it! 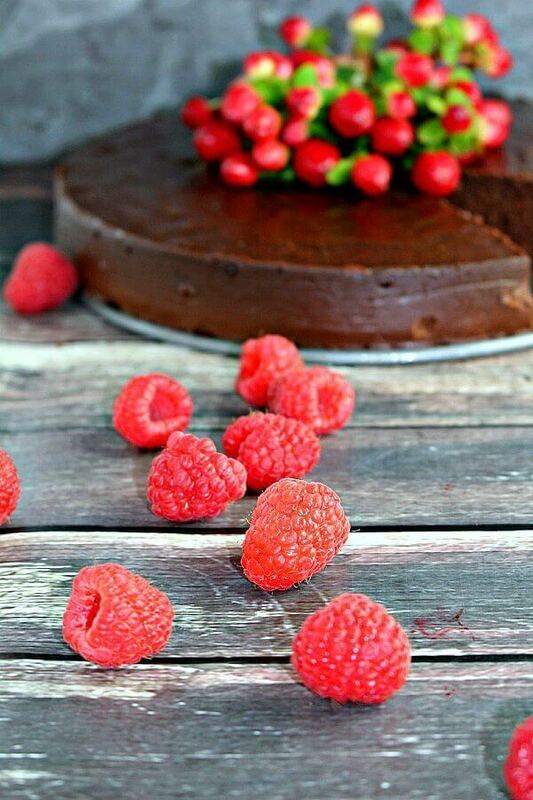 And I love chocolate and raspberries together! Oh my goodness his looks so dreamy! I am licking my lips over this raspberry sauce! 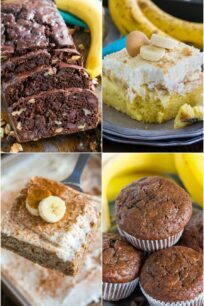 Putting it on my hostess with mostess recipe try out list!